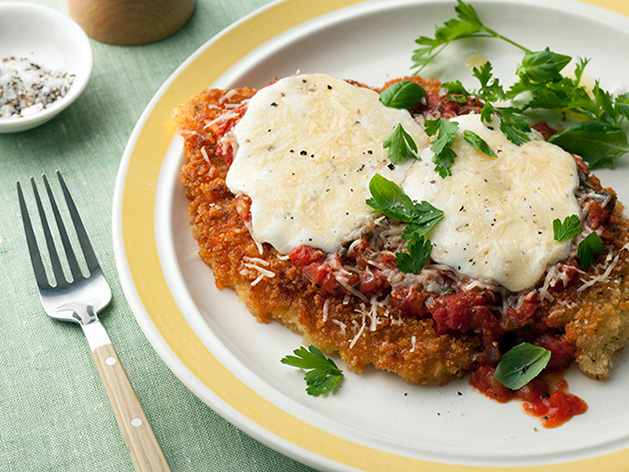 When you think of homemade food, one of the first recipes to pop to mind is chicken parmesan. This Italian inspired dish is one of the most loved comfort foods thanks to its simplicity, its rich taste and just how easy it is to make it. 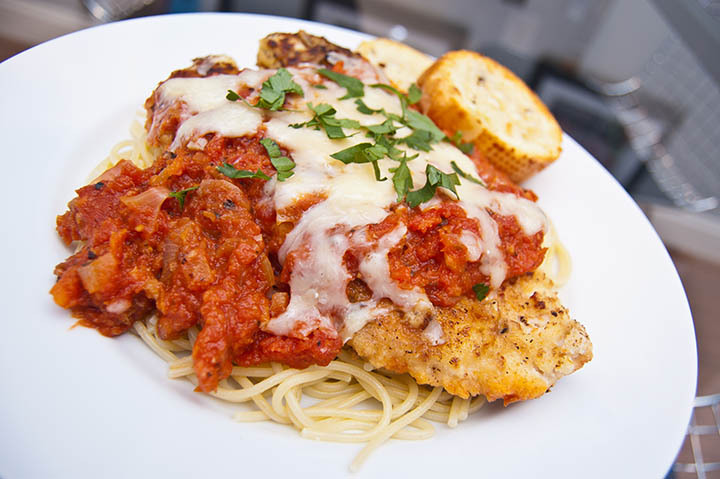 Chicken parmesan is the kind of recipe you can always change and alter to fit your needs and the taste of your family which also makes it a versatile choice for picky eaters and busy weekday nights. This short recipe will teach you how to cook chicken parm in 7 easy steps…or 10, if you feel adventurous enough to make the sauce from scratch. ¾ Cup of Onion, either grated or thinly sliced. ​2 garli﻿c cloves, peeled and minched. ​28 oz of crushed tomatoes. You can buy them canned or crush them yourself. ​1 tsp of oregano. Dried. 4 boneless chicken breasts, halved. ¼ cup fresh mozzarella chees﻿e, preferably grated or shredded. ​½ cup provolone cheese, grated. This recipe serves 4 but only you know the appetite of your family. If you feel like you need more or less cheese then go ahead and change that to your preference, just remember that the more cheese you use the longer it’ll take for it to melt so you might have to lower the oven temperature slightly. 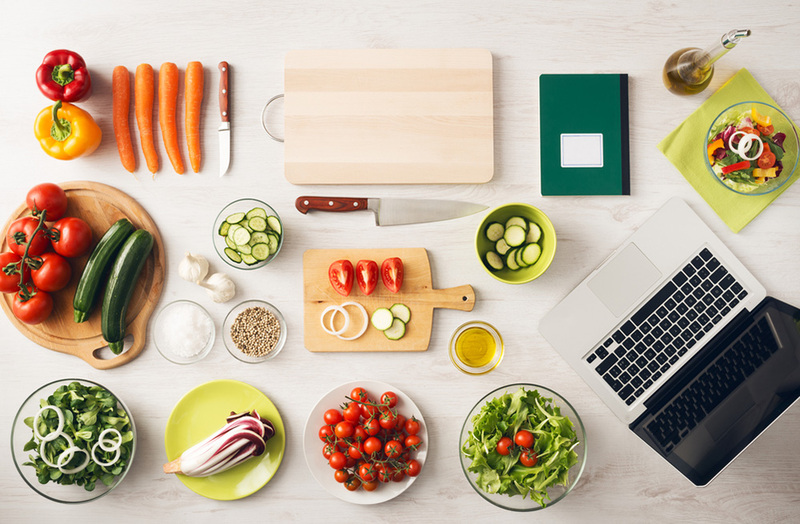 Once you’ve collected all the ingredients it’s time to start cooking!! The sauce should always be cooked first, not only because you can do it while you preheat the oven but also because it needs to be ready once you’re done with the chicken so it pays to think ahead. If you’re making pasta as a side dish, save some of the pasta water in case you need to thin the sauce. It’s an old Italian trick that you’re going to love! 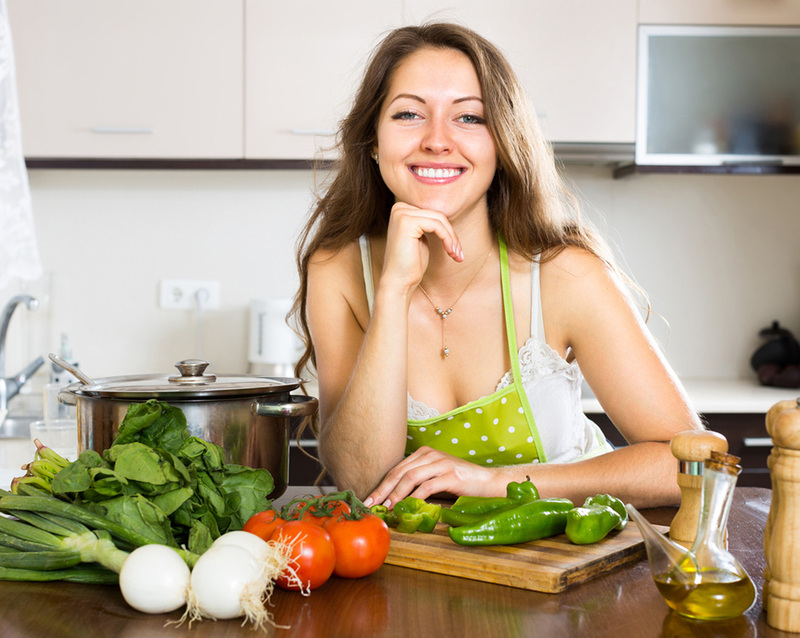 In a sauce pan, heat up ¼ cup of olive oil and add about ¾ cup of onion, either thinly sliced or grated. Sauté for 3 minutes or until brown. Add your garlic and cook for about a minute or until fragrant. In total, the onion shouldn’t be cooking for more than 4 minutes. Once the onion and garlic have been sautéed, add the crushed tomatoes, the oregano, the red pepper flakes and, lastly, the sugar. Mix thoroughly before letting it heat until it simmers, then reduce the heat and cook, covered, for about 10 minutes. Tip: Using copper cookware to make the sauce? Don’t! Copper will react with the tomato and can alter the taste of your sauce. Once your sauce is simmering proceed to cook your chicken. If you think your sauce might burn while you do this, take it out from the heat and start warming it up again when your chicken is in the oven. Preheat your oven to 450 degrees. This needs to be the first step so the oven has reached the ideal temperature by the time you’re ready to cook the chicken. Grab your chicken cutlets or breasts and place them between two layers of food safe plastic (freezer bags do the trick) on top of a solid surface. Firmly pound each cutlet or breast with a meat mallet, a frying pan or even your own hands. Continue doing this until the chicken is about ½ inch thick. 1.- A deep bowl, where you’ll beat your eggs and 2 tbsp of water. 2.- A shallow dish with flour. 3.- A shallow dish with bread crumbs. 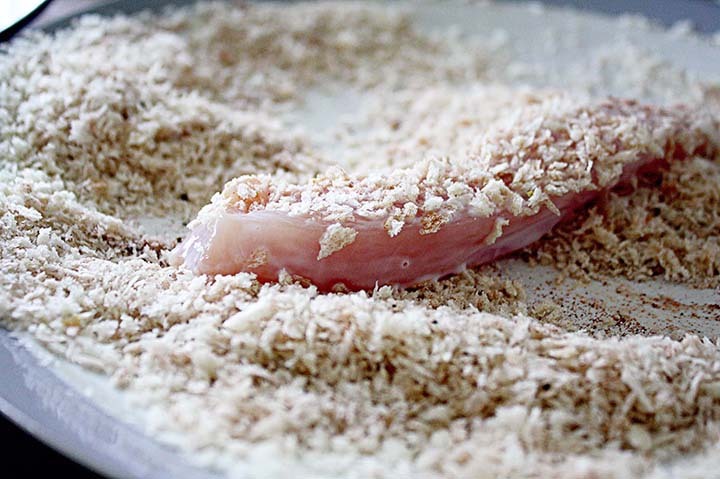 - Take each flattened chicken breast and dredge both sides on the flour. - Dip the chicken breasts in the egg mixtures and let the excess drain. - Dredge the chicken breasts on the bread crumbs, pressing gently to make sure the bread crumbs stick. - Set aside and repeat the process. Heat 1 cup of olive oil in a l﻿﻿arge skillet or pan. Once hot, cook your chicken breasts for about 2 minutes per side or until slightly browned. Be careful not to leave the chicken on the skillet for too long, as this will increase your chances of overcooking it once it’s in the oven. Carefully arrange the chicken breasts on a baking dish once they’re all cooked and layer generously with the sauce. Alternatively, you can cover the bottom of the baking pan with sauce first, arrange the chicken breasts second and add more sauce for good measure. You didn’t cook your own sauce? That’s okay! Just add the tomato sauce of your preference! It can be added cold, as it will heat up in the oven, but it’s better if it doesn’t come straight out of the fridge. 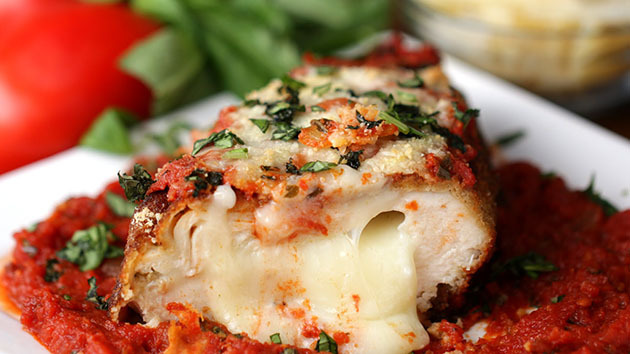 Layer each chicken breast with mozzarella, provolone and sprinkle everything with parmesan. You can also add fresh basil on top of everything to improve the taste. Bake for 10 minutes or until the cheese begins to brown. You now know how to cook chicken parm and make your own tomato sauce in the process. 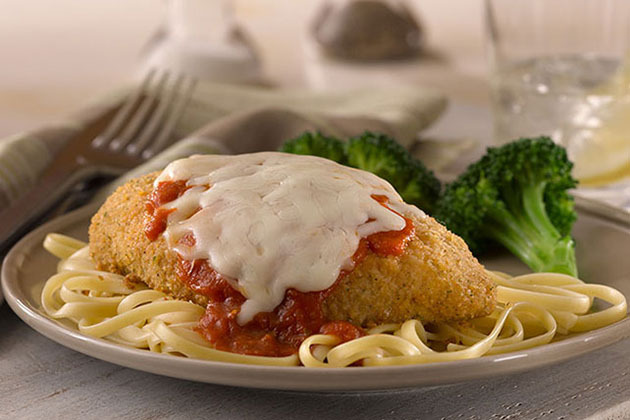 We hope you’ve found this recipe fun, easy to follow and that the chicken parmesan you cooked tasted delicious. If you liked this recipe and wish to see more like this, please share it and don’t forget to leave a comment letting us know what you think.